Saturday, I went to the Metropolitan Opera simulcast of "Die Walkure." I have gone out of my way not to read any reviews of it because I wanted to think my own thoughts. Somehow "Walkure" has become one of my sacred cow operas, one of a handful that I am very particular about. I think it began when my sister and I went to Toronto and saw it at the Canadian Opera Company. 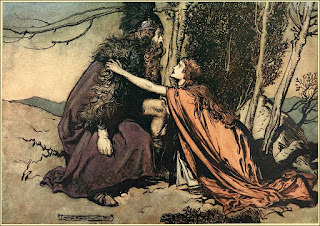 We had lost our dad not that long before that and we were totally not ready for what Wotan's Farewell was going to do to us. All through that final scene we cried and cried, passing a single soggy Kleenex back and forth. We were still crying as we left the opera house. Because we were so undone we went for a glass of wine, and we spied Wotan and Brunnhilde a few tables away, quarrel forgotten, eating Buffalo wings. How could you not cheer up, seeing that? Now I think I would go up and say hello, say something. But I was shy then. I have another "Walkure" story that I know I have told here before. 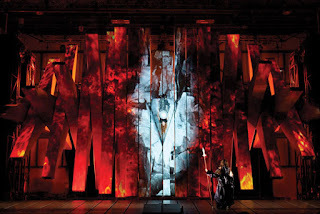 That one involved the Met and James Morris as Wotan, not that I was there, but I feel as if I was. -- that I found today and adore. You can really see his personality there. That rakish smile, irresistible. And a creative take on the part. Jamie Barton, as his wife, is a kick too but maybe too much, a little too funny. You have to watch it. Seeing this gives a new dimension to "Walkure," where these two singers are together again. In "Walkure" things are less sunny with these two and he is more world weary, as Wotan should be. I loved him, how can you not? But he does not yet have the overwhelming .... can I use that cliche word gravitas? It makes me laugh but maybe I have to ... that Wotan should have, that the big Wotans of history had. The big Wotans of history. They cast a long shadow, terrible to any singer these days. I do not envy present-day Wotans, I will tell you that right now. You have big powerful supermen like Hans Hotter. 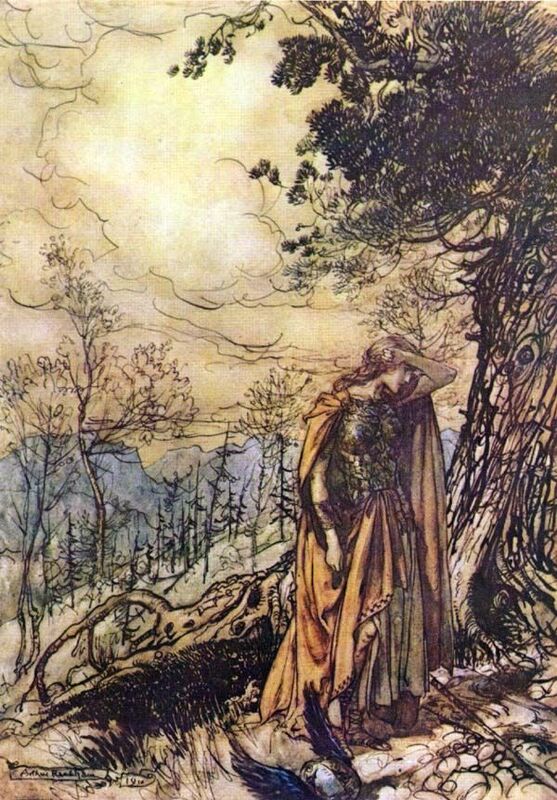 He picks Brunnhilde up in his arms as if she is nothing. Just doing what needs to be done. As does Donald McIntyre, here with the beautiful Gwyneth Jones. That last clip, from a Bayreuth production, really got to me. They just took it to the wall. The sweat and tears on Wotan's face, the intensity and drama. The flames and the smoke. That brings me to a problem I had with the Met production. The staging was too complicated. They had this set of sort of seesaws -- I think they used that word -- that was supposed to stand in for the Valkyries' horses, or something. It did not work, at least from where I sat. Maybe if you were at Lincoln Center the seesaws worked better. To us in the movie theater they just looked like seesaws. Not only that but at intermission we had to try understanding how they worked. They had stagehands explaining them. If there is one thing I hate it is someone trying to tell me how they stage something, how a movie was made, anything like that. Now when I watch the actual production I am thinking about how they did it. What a pain. And for what? 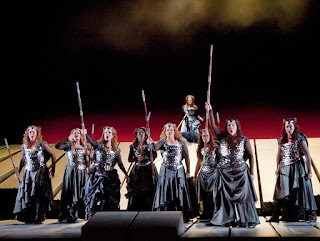 There was one cool scene that had you looking down on Brunnhilde as if from above. I think that is it at the top of this post, though it is hard to make out. But otherwise the last scene could have been staged a lot better. And as Brunnhilde settled into her resting place, it looked for a moment as if she were pitching backwards. You do not want that. You want flames and smoke. It is not rocket science. Wagner will do the rest. Well, at least this production was not horrible like this other one I wrote about this other time. Let us hash over the other singers. Brunnhilde (Christine Goerke) was too cartoon-ish for me at the start but I warmed up to her. 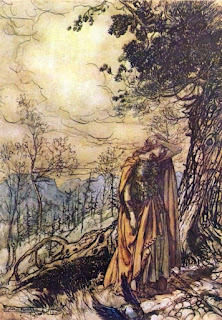 There is this haunting scene when she appears to Siegmund as a portent of his death. The music grows trance-like as she tells him who she is and what her appearance means. There is a moment when he meets her eyes, sealing his fate. Goerke was lovely in that scene, just devastating. Tomorrow I will research other singers singing that scene. There go another five hours, you know? Siegmund and Sieglinde, I liked them both. Sieglinde was just beautiful, I mean she looked the part. Eva-Maria Westbroek, her name is. She was glorious. And in the all-important role of Hunding, Sieglinde's Neanderthal husband -- a part I love, and that my father loved before me -- was ...let me check ... Gunther Groissboek. I am a complete Gunther Groissboek fan from this moment on. He has this marvelous voice and he knows how to use it, which is often out of a corner of his mouth. A spectacular Hunding, spectacular. "Badass," I whispered to my friend Nisha, sitting next to me, between me and our friend Meghan. I am privileged to have not one but two friends willing to spend five hours at "Die Walkure." One touch I loved -- it might be in the script, who knows? -- is how Hunding hangs his Neanderthal furs on Nothung, the magical sword stuck in the tree. At intermission Grossboek confided that he had been tapped to play Wotan at Bayreuth. Do it. Do it! But at the same time I would also like to see Greer Grimsley tackle the part at Bayreuth. In another year or so he should be ready. He is 62 now but as Wotans go that is young. I have multiple careers I will be following thanks to this production. And multiple hours in store for me on YouTube. It is about time the world joined me in waking up to the greatness of Leonard Pennario. It is happening. The other day I rejoiced in France Musique's five-day exploration of the recently released Pennario RCA box set. Today I got word that the Los Angeles Philharmonic is featuring Pennario in an upcoming exhibition! This is great news. As I told the L.A. Phil staffer who reached out to me, Pennario was always proud of his association with that orchestra, ever since he made his debut there at 14, under the baton of the great Otto Klemperer. 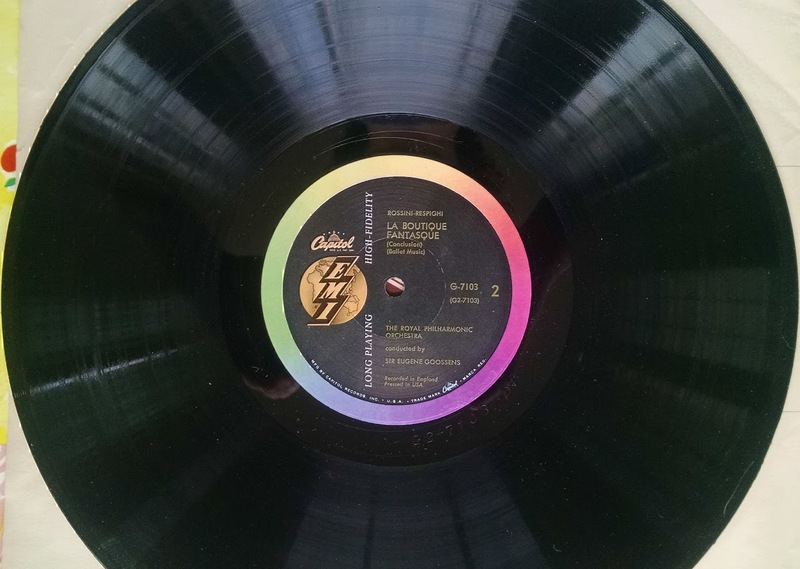 The featured performance comes from the Los Angeles Philharmonic's archives and is of Beethoven's Triple Concerto. 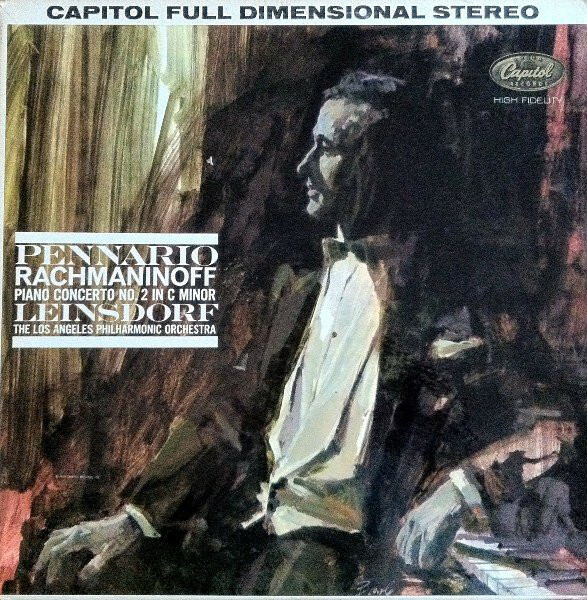 This makes me very happy because Pennario never made a record of this particular piece. He performed it only a handful of times -- three or maybe four, not more than that. Pennario was funny that way. 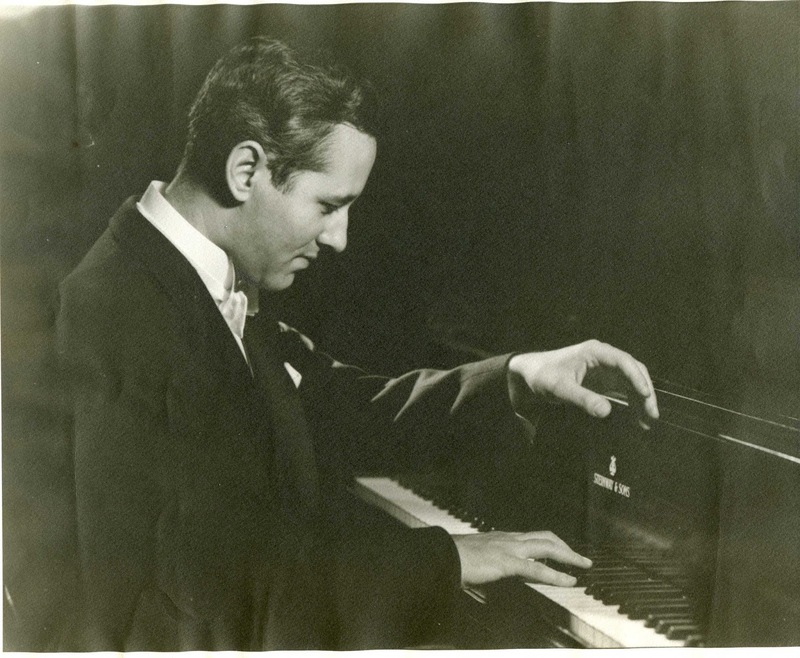 It was totally normal for him to do a concerto only once or twice in his life, on demand. He had that capability. I will present the rest of the details as they reach me. Either that or I will present them tomorrow when I have occasion to look them up in my overstuffed files. I was ready just now to start guessing who the two other soloists are in the concerto, but just so as not to confuse things, I will get the facts. This concert is on file somewhere in the other room and I will be able to tell you the who, the when, and the where, if not the how and the why. This exhibition must be part of the orchestra's celebration of its 100-year-anniversary. They must be looking back on highlights. What a lucky group of musicians to have Leonard Pennario living right in their back yard, and soloing with them on a regular basis. And to record with them, too, on multiple occasions. That fine record at the top of this post featured Pennario playing Rachmaninoff with the Los Angeles Philharmonic and conductor Erich Leinsdorf. How gracious of L.A. to remember L.P. The name Leonard Pennario is being spoken! 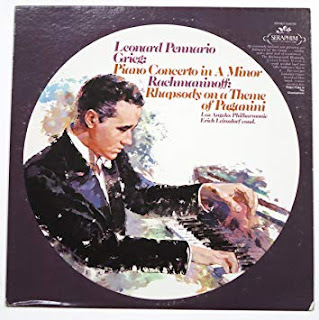 RCA's newly issued box set of Leonard Pennario's RCA years has made me really happy. Yesterday I saw that France Musique celebrated the release with a five-day tribute. It starts out with Pennario's sweetly haunting performance of Fritz Kreisler's "Liebesleid" and goes from there. In between the selections there are beautiful voices speaking in French which, je ne comprends pas, but I hear the name Leonard Pennario spoken and that is enough for me. The French have a beautiful way of saying Pennario's name. "Lee-o-NARD Pennario" kind of comes close. That actually makes me laugh because this Italian historian here in Buffalo, Joey Giambra, he has been known to refer to Pennario as "the Nard" or "Nardu." I have listened to the first installment and moved on to the second, which begins with Beethoven's "Fur Elise" and moves on to the Schumann Piano Concerto. 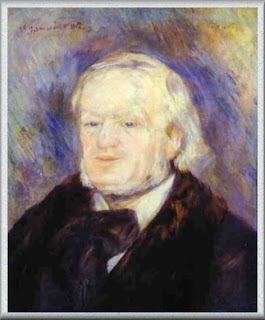 No one in the United States would ever play Pennario playing Schumann. Zut alors! I wish I could understand French better. Pennario would have been able to understand it, no problem. Oh well ... It is the thought that counts. I will be returning to this podcast, or whatever it is, with great pleasure. I will report on it. I have been studying up on art and illustration and several artists and illustrators are emerging as my favorites. 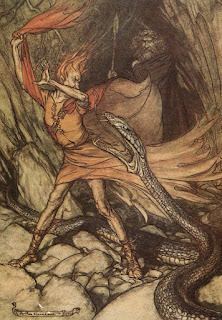 One is the British illustrator Arthur Rackham. The name was new to me, I have to admit. But he is a recognized great and has been for a long time. 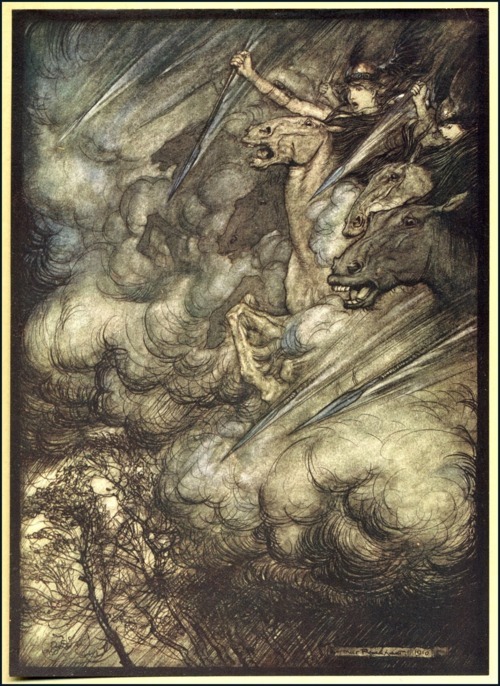 Talking about "Die Walkure" yesterday I seemed to recall reading that he had illustrated Wagner's "Ring" cycle. And sure enough. And the Ride of the Valkyries. Zowie! I would guess this is Brunnhilde doing some soul searching. 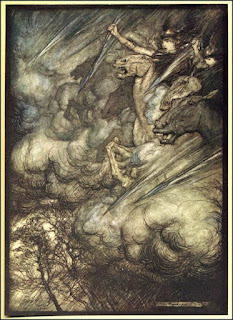 Dover Publications has put out a book of Rackham's Wagner illustrations which I just pinned on Pinterest on a brand-new board I have titled Art Books I am Craving. No wonder artists love Wagner. What images. Anything you want to paint, you can paint! It is all in there somewhere. I do not know for sure that all visual artists love Wagner. But I have an ongoing list and so far the list has two biggies, both favorites of mine -- Pierre Auguste Renoir and John Singer Sargent. If it looks a little funny it was a year before Wagner died and I do not think he was feeling too well. But I love the colors in the background and it does give you a sense of vivid imagination, both on the part of the musician and the artist. One may while away hours contemplating such matters. 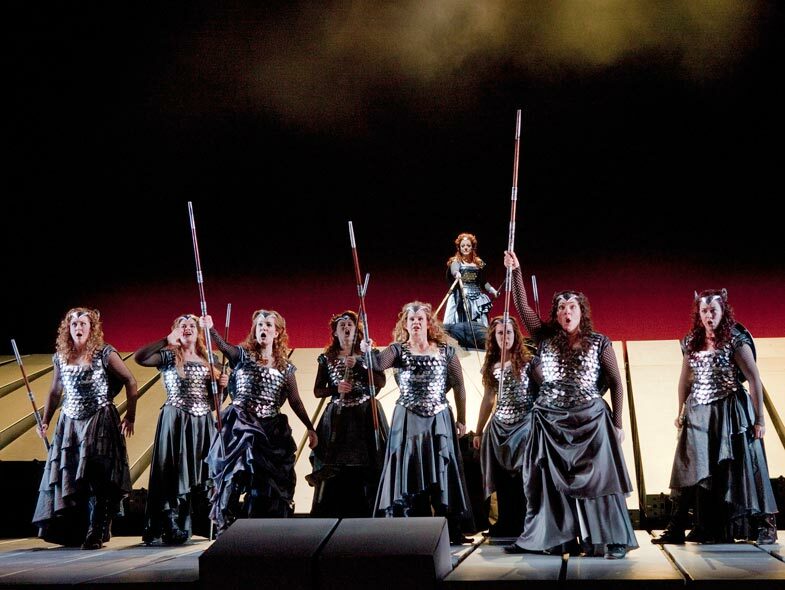 Having gone to see the "Carmen" simulcast a few weeks ago I am psyched for "Die Walkure," coming up on March 30. That is a picture I found from it up above. Where are the horned helmets??? I do not see any. .. about seeing the simulcast when it is a simulcast, when the opera is going on in real time at the Met in New York City as you are seeing it. Plus, I will tell you one thing, I want to enjoy these simulcasts while we have them. When we went to "Carmen," which I never did report on, the theater was empty. And I do not mean for the opera. For the entire theater! Approaching the Elmwood Regal Cinema, I thought the place was closed. It did not look open. I have not gone to the movies recently, because although I try to keep up with what is showing, there is nothing really I want to see. But it was not that long ago that I was going to movies. I reviewed a lot of them for The Buffalo News. That was only a couple of years ago. The place would be packed. Kids must not go to movies anymore. And it was not that I was early, either. "Carmen" let out about 10 p.m. and there was nobody there then, either. How do they keep the theater open? My friend Meghan and I were just about the only people in the place! Anyway. To go to "Walkure" you have to be something of a major opera fan because it is quite the commitment. I am lucky to have a few friends who want to go. Not that it would be a problem going on my own. I have gone to many movies on my own in the line of work and I could easily do it again. But I feel blessed to know people as whacked as I am -- that is, whacked enough to commit to four hours or whatever. Here is the sked from the Met website. How about that? It adds up to four hours 55 minutes. Five minutes short of five hours!! I guess when I invite extra people along I should warn them. As I may have mentioned, I have an Etsy shop called The Old House Downtown that features vinyl records that catch my eye in one way or another. It is highly subjective! I get a kick out stocking it. And I have learned a lot from working on it over the last several years. The history of records is the history of music. It has helped me in my research of Leonard Pennario, the great pianist I am writing my book about. I know all the years that Pennario's records came out, first on Capitol, then on Capitol / EMI, then on RCA Victor, and then back at EMI, on Angel Records. I love seeing what was going on at the same time his records emerged. I am fascinated by the record business and I love seeing the big picture. And every once in a while you run across something really cool. For instance today I listed this beautiful record of the Rossini-Respighi ballet "La Boutique Fantasque." 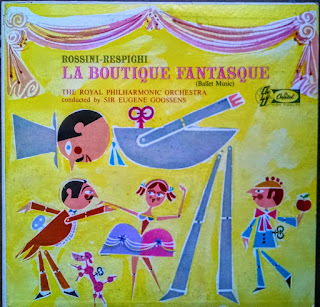 I love the music of Respighi. As I wrote in the description of the record, he has the most beautiful way of re-imagining the melodies of an earlier era. That is only one of his skills but it is something I have always enjoyed. Another skill is, his orchestration is so colorful. He really knew how to use all the different instruments. A master orchestrator. This album offers something extra special -- that great mid-century cover. That yellow cover! That gentleman in the top hat bowing! The ballerina with the pigtails! Now I am going to really nerd out. 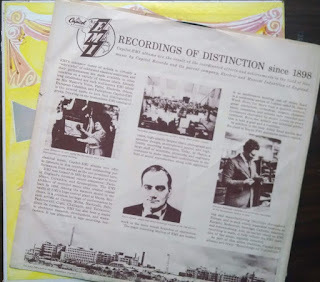 There is the matter of the dust sleeve. Even as a Capitol Records enthusiast, I had never seen this particular dust sleeve before. 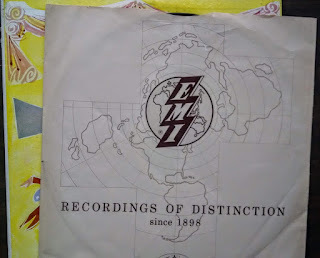 The dust sleeve clearly dates to not long after EMI acquired Capitol Records, which it did in 1955, because the notes spotlight the acquisition. 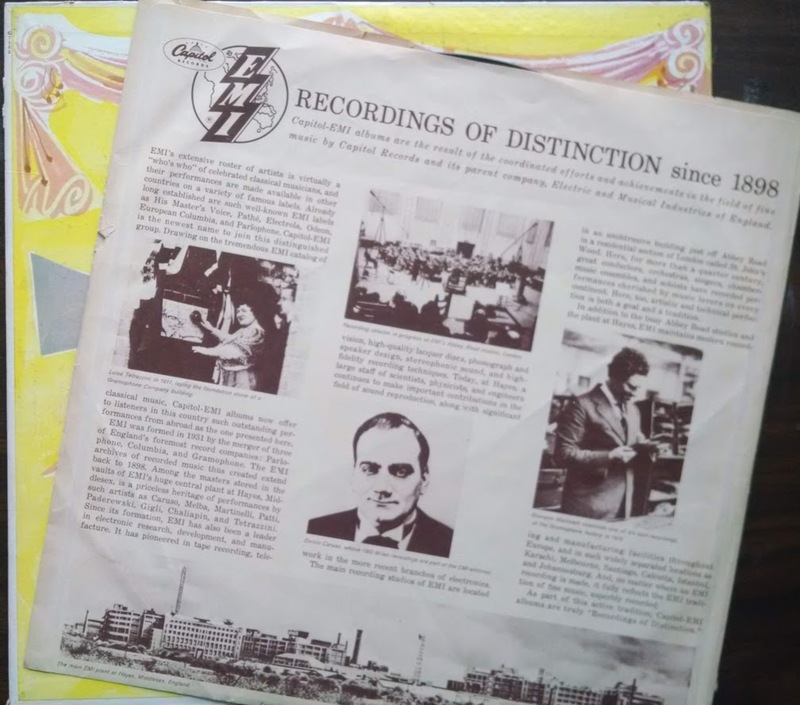 The very British performance from 1957 features the Royal Philharmonic Orchestra and Sir Eugene Goossens and the notes on the dust sleeve make a big deal about the Abbey Road studios, explaining that Abbey Road is a nondescript street in the London neighborhood of King's Cross. It would still be a few years before the Beatles made the name famous. EMI was obviously very proud of the Abbey Road studios. The label too was something I had never seen before. It was Capitol's famous rainbow design but also snazzy lettering reading "Capitol EMI." 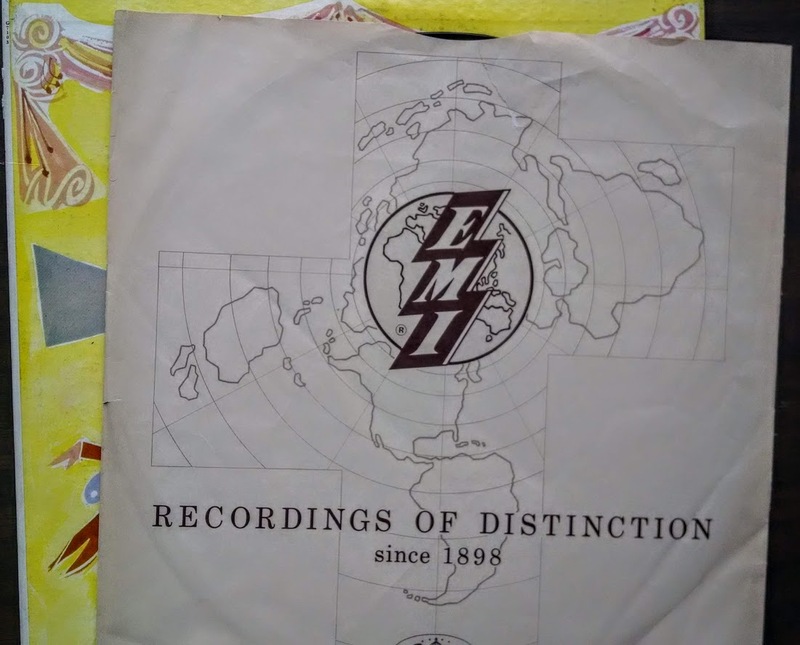 The "EMI" looks like a lightning bolt. Clever! Maybe this design was used a lot but all I am saying is, I had never run across it. This record captures a particular moment in time. That is what I love about vinyl. That and, it is such a delight to behold -- the cover art, the record itself, the packaging, everything. I could tell that Howard was tuning me out as I trailed after him from room to room this morning trying to call his attention to the greatness of these matters. Howard, look at this dust sleeve! Now the damage is done. I do not want to part with it. I might have to go and buy it myself! I am going to start writing about new CDs on this site, just for fun. I was honored for years to review CDs for The Buffalo News but now that I am on my own, why stop? German Lieder is something I have loved since I was a teenager and my brother Tony gave me the Seraphim Guide to German Lieder, which was one of the best presents I have ever received in my life and one I would recommend to anyone. Because I follow the Lieder -- sorry, I could not help that -- I was interested in a new record on the Supraphon label of Schubert's "Die Winterreise" by the Czech bass Jan Martinik. Martinik is a millennial who won the competition a few years ago for BBC Cardiff Singer of the World. Cardiff is in Wales and if you can win a singing competition in Wales you can win one anywhere. Those folks in Wales can wail! Look at Bryn Terfel, Gwyneth Jones or, heck, Tom Jones. Here is Mr. Martinik singing for the discriminating and musical people of Cardiff. And here he is in his winning performance, which was Schubert. 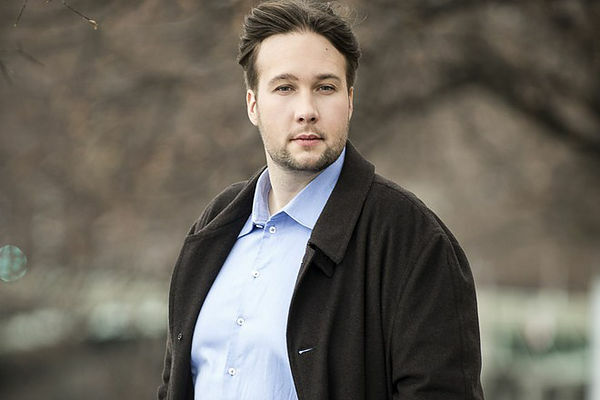 Having listened to Martinik's "Winterreise" I can say he has a rich and appealing voice. It is not a deep barrel bass. I would call it smooth and lyrical. And his approach to "Winterreise" is lyrical. I think it is too much so. Certain lines should just be spat out: "Ihr Kind ist eine reiche Braut!" Your daughter is a rich bride! You have to take that to the wall. Fling it out. Other lines should be hardly breathed: "sacht, sacht, die Ture zu." Close the door softly. Very sad, that line in the first song, "Gute Nacht." If Martinik had a contrast control I would tell him to turn it up. The lights have to be lighter and the darks darker. You learn that in art too. You do not want everything to be too delicate. In music like this you need to be restrained but also, at least on occasion, fearless. There are times when "Die Winterreise" careens into real anguish. Watching that Schubert video up above makes me wonder. Martinik is intense there. He connects with an audience. He brings out the haunting nature of that song. I wonder if he has to learn to do the same thing on studio recordings. It can be a challenge. You do not have the audience there. All that having been said, the recording has a lot going for it. The pianist, David Maracek, clearly appreciates Schubert and brings out the subtleties of the accompaniments, which are often spare, almost avant-garde. And Martinik's quiet emotion does carry him a long way. A reflective song like "Der Lindenbaum" has a natural grace and sense of rhythm and tone. Martinik is a pleasure to listen to. The heartiness and the power of his voice break through occasionally like the sun. (OK, like the winter sun.) He gets across a subtle sense of foreboding that gives the music atmosphere. All he needs is to take things to the next level, and there is no reason he cannot do that. Thinking back on all the Schubert recordings I reviewed for The Buffalo News I realize I have leveled this kind of criticism many times, that singers are too cautious. I guess it is just how I feel. Plus, maybe I wish I were a singer, I admit it. Also I have listened to a lot of the greats singing these songs, because I am so crazy about this music, and when you do that you get an idea of what can be done with them. But on the bright side I think that, as I said, this is something that can be learned. And grown into. Martinik was born in 1983 which makes him what, in his mid-30s? He has time. He has the pipes. He has what it takes. I hope he sings more Schubert! He could start with "Die Schoene Mullerin."